Energy efficiency in buildings requires, among other things, that ventilation be appropriately dimensioned: too much ventilation wastes energy, and insufficient ventilation leads to poor indoor air quality and low comfort. Studies have shown that ventilation systems seldom function according to their commissioned design. They have also shown that airflow measurement results are essential in improving a ventilation system. 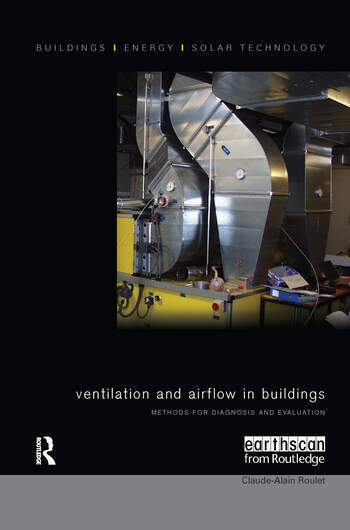 This key handbook explains why ventilation in buildings should be measured and describes how to measure it, giving applied examples for each measurement method. The book will help building physicists and ventilation engineers to properly commission ventilation systems and appropriately diagnose ventilation problems throughout the life of a building. Drawing on over 20 years of experience and the results of recent international research projects, this is the definitive guide to diagnosing airflow patterns within buildings. Claude-Alain Roulet, an international leader on the subject of the indoor environment quality and energy in buildings, is Adjunct Professor at the School of Architecture, Civil and Environmental Engineering, Ecole Polytechnique F?d?rale de Lausanne, Switzerland.